– Bitcoin behaves like an extreme commodity. Its impulses have a curved look with slower second waves, quick fourth waves, and strong sharp fi!h wave extensions. This tendency shows up in bullish and bearish waves. – Third waves are much longer than first waves, and fi!h waves are longer still. Again, this is an extreme version of typical commodity behaviour. – The middle of its third waves may exhibit Fibonacci ratios within them, but overall it does not regularly exhibit good Fibonacci ratios. This would make target calculation particularly di"icult. – Candlestick reversal patterns are common at the end of Bitcoin's strong fi!h waves. These are engulfing patterns or star patterns with very long wicks on the final candlestick. 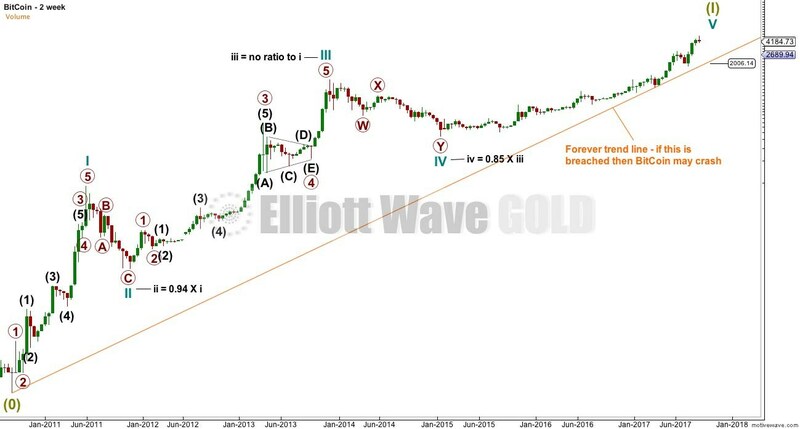 – Early second wave corrections are extremely deep, close to 0.8 and o!en deeper than 0.9 the depth of the prior first wave. The "forever" trend line should be used to indicate when the top may be in for BitCoin. If this line is breached, the probability of a crash will increase (it will not be certain, only highly likely). The weekly chart looks at the possible structure of cycle wave V, the final fi!h wave. It looks like BitCoin may be due for a primary degree correction. Given that its fourth waves tend to be quicker than its counterpart second waves, primary wave 4 may only be a Fibonacci 13 or 21 weeks. However, it may be longer lasting if it subdivides as a triangle, possibly even up to a Fibonacci 55 weeks. If this analysis is wrong, it may be in expecting primary wave 4 to reach down to the 0.236 Fibonacci ratio. Primary wave 4 may not be that deep and may end mid way within the channel. 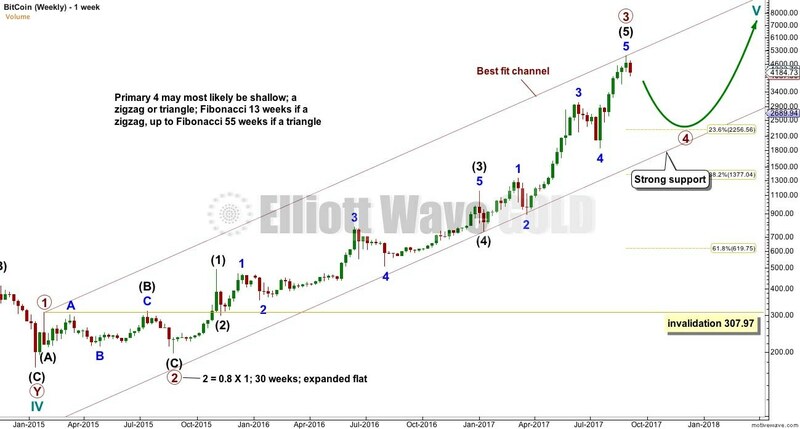 Our service is educational, we aim to teach you how to learn to perform your own Elliott wave analysis.